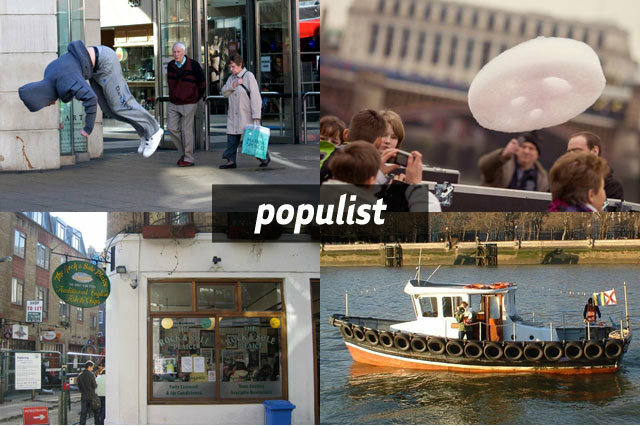 Populist brings you a bite sized round up of the best of Londonist this week. Catch up on the coolest, quirkiest, most recommended and talked about stories and find out what's hot and what's happening for the week ahead. What does the future hold for Time Out? Boris dared to dream ambitious tube dreams and Olympic plans for greenway walking and cycling routes were unveiled. It was all about phallic towers this week: at London Bridge's Spires and Shard and our brave pledge to climb Tower 42. Check out the news archives for more. The Barbican's private parts due for redevelopment. Princely Persian food and pancakes. Duke Mitchell's cosy Kings Cross film club and Clerkenwell's Well's generous Wednesdays. Check out the Arts and Events and Food and Drink archives for more. Images clockwise from top left: caption this, Happy Cloud, punny shop names, Plouf!